Shredder. Photograph by Suzanne Shoemaker. This week I focused my efforts on reconditioning Whiskers for release, and giving Squeak-toy daily physical therapy. 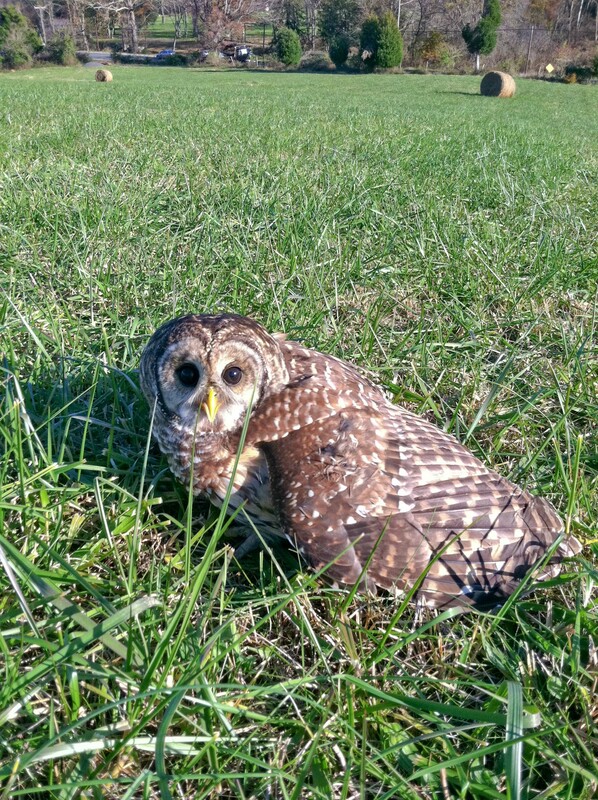 Whiskers, the juvenile female barred owl, was given five flight sessions on a creance line; a long line attached to jesses on her legs. Each time she flew stronger and farther before tiring. Whiskers had us convinced with her first flight, that she would be ready for release soon. We are making plans to have her banded, and transport her back to her home territory in Upper Marlboro later this week. I’ll try to photograph her release and post photos for you next week. Squeak-toy, the juvenile male red-shouldered hawk, is making progress too, but his physical therapy is hard work for both of us. His right wing muscles are tense and contracted, so we work to get him to relax and extend his muscles. We stretch the wing to its full length, and rotate it at the shoulder joint, gently pulling it through the motions of flight. A short flight session on a creance follows, and then we repeat the physical therapy while his muscles are still warm. After one week of this daily routine, I can both feel and see progress. During physical therapy, Squeak-toy’s muscles feel more relaxed and stretchable; and in flight, his wing is extending farther, making him more balanced and symmetrical. While this is encouraging to see, he is not yet getting much lift or forward momentum, so his flights are short. This may be partly due to feather damage in that right wing, a result of wing-droop from the injury. The droop causes the wing to drag on his perches, wearing the feather tips. Unfortunately, we cannot correct his feather problem before he makes more progress with the physical therapy. 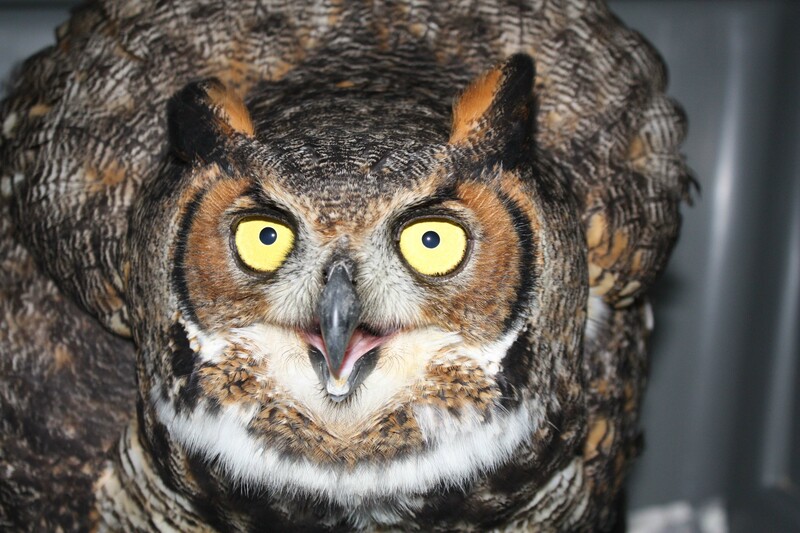 Meanwhile, Shredder, the great-horned owl, requires another week of cage rest. We visited Opossum Pike Vet Clinic this week, where Dr. Barb Stastny did a follow-up examination of his fractured left humerus. The bone has formed a nice callus, though there was a slight slippage and shortening of the bone at the fracture site. It is difficult to say if this will cause problems with his flight capabilities without putting him to the test. At the end of this week, we will move him to an outside mews (flight cage), where we can begin to assess his flight, but the true test will come when we fly him on a creance line. Whiskers lands in the grass after a short flight on the creance line. Photograph by Suzanne Shoemaker. omg.. that is the cutest face I have ever seen. Suzanne…you are where you should be. What great work you do. Thank you, Pat! This means a lot to me, coming from you. I do believe I am where I should be now. It feels right, like I’ve found my niche. I miss you. Please call me when you are back in town! Great pictures, and we’ll be looking forward to reading about how they all make out. Thanks for the update!